Pure gold, in cauliflower form. 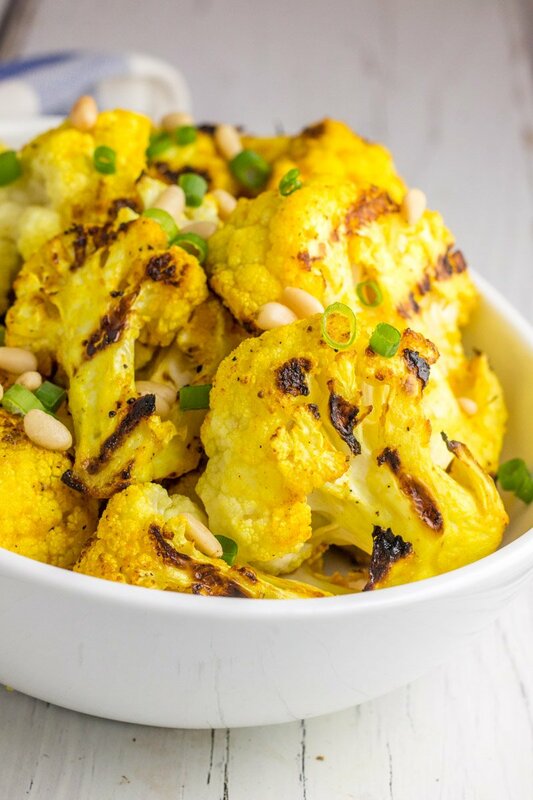 If you’ve exhausted all the ways you can make cauliflower, and need new side dish inspiration, this grilled golden cauliflower is just the ticket. The perfect blend of spices to add some major flavor to cauliflower, and lightly charred to perfection. My creative dinner skills have been lacking lately…. I’ll say it once and I’ll say it again, dinnertime is an insanely stressful, ‘witching hour’ event in our house. For some reason once 4:40ish hits, my children become starving, highly emotional, clingy human things that demand my full attention despite nothing appeasing them. Some day I am going to count how many times my three year old says, “MOM! MOMMA! MOOOOM! MOMMY. MOM. MOM. MOM. MOMMA. MOOOM. 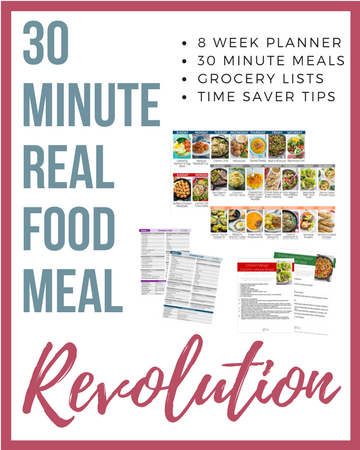 MOMMY!” Then I’ll also start a tally list for the amount of times my one year old throws his arms up demanding I hold him the moment I have my hands in raw meat, or as I’m opening the oven, or right in the middle of chopping everything with a very large and sharp knife. Never fails. So needless to say, I’ve been throwing surer lame dinners together and using easy sides to make it interesting. “Yep, turkey burgers again kids.” Sorry I’m not sorry. Luckily I’ve stepped up my ‘side dish’ game and am trying to get creative with veggies so I don’t die of dinner boredom. And just when I think I’ve exhausted all options for cauliflower (rice, mashed, roasted, boiled), I came up with this grilled golden cauliflower and my life is complete once again. 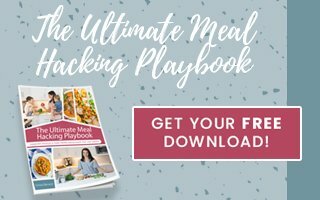 BONUS – it’s paleo and Whole30 compliant too!! 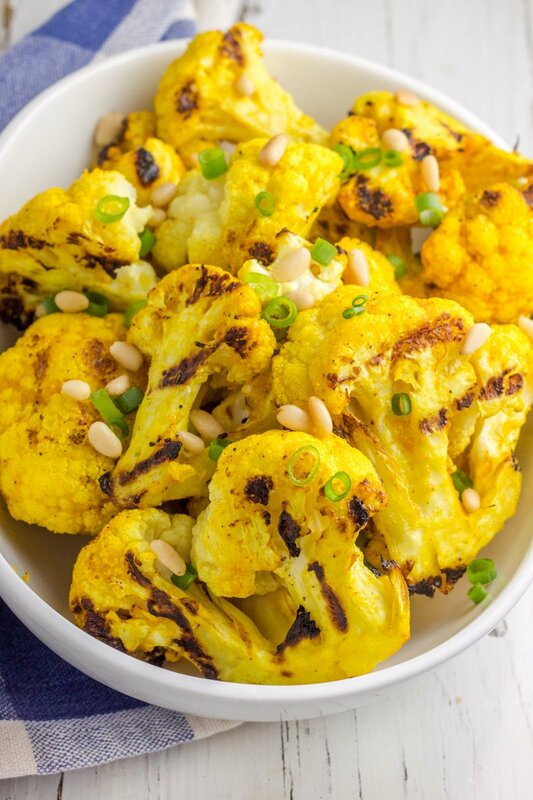 I’m telling ya, the combined spices in this grilled golden cauliflower are perfection. PER-FEC-TION. And guaranteed to bust veggie side boredom. But not guaranteed to make your kids behave during dinner prep. 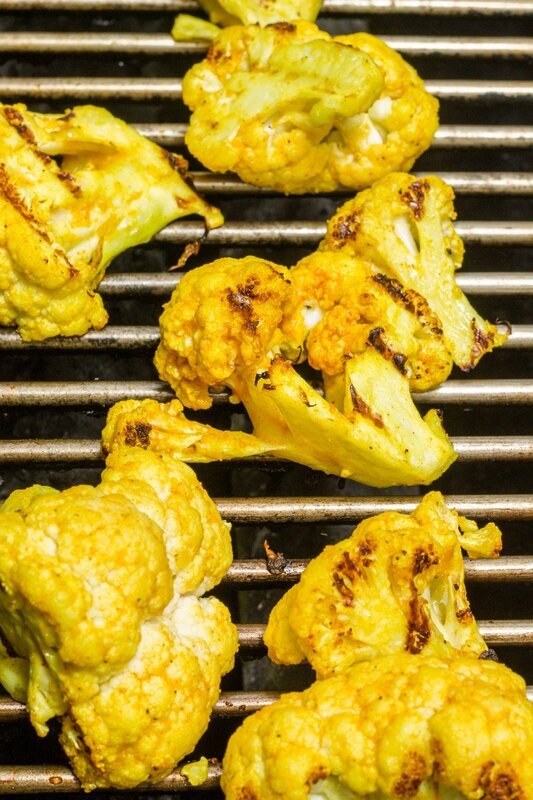 Just throw that cauliflower on the grill and marvel at the ease. Marvel my friends. 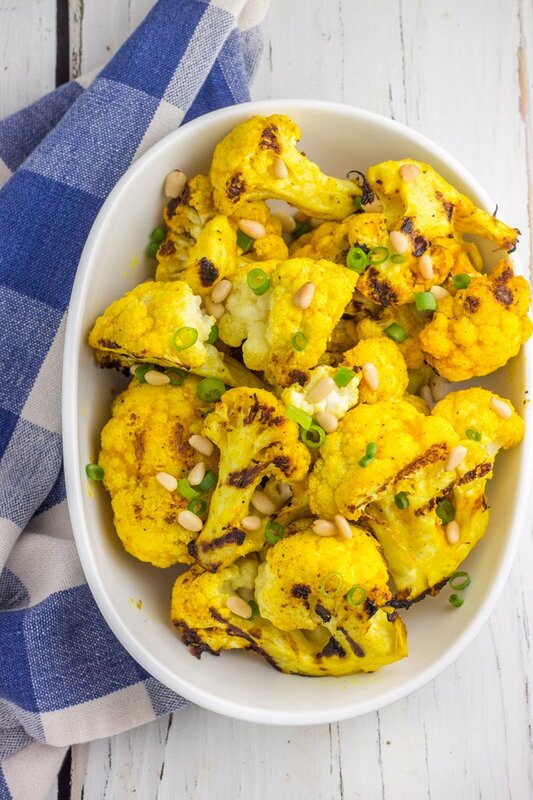 I’ve already made this grilled golden cauliflower a handful of times since creating it and know it’s going to be a favorite for a loooooong time. It’s the perfect summer side that will make you love cauliflower all over again. Here are some other vegetable side dishes to help your dinner game this summer! Whole30 Pina Colada Cole Slaw, Orange Balsamic Grilled Brussels Sprouts, Walnut Pesto Roasted Potatoes, Mandarine Orange Green Beans.